This beautiful holiday apartment is entered via Cranston Street. 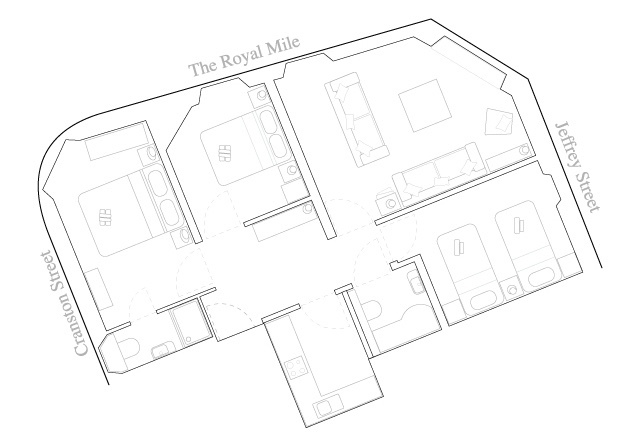 The entire property is located on the corner of The Royal Mile, giving the benefit of every room a different view either up or down the 'Mile. This particular Edinburgh apartment has 3 large bedrooms, 2 doubles one of which has a en-suite. The lounge is spacious enough to offer 2 single Divan Ultra Aerobeds if required to take the occupancy up to the maximum of 8 adults. Some of Edinburgh's historic landmarks and tourist attractions such as Edinburgh Castle are only a short stroll up The Royal Mile from the apartment. A stunning contemporary lounge with huge windows overlooking the famous Royal Mile. This Edinburgh Holiday Apartment was fully refurbished in late 2004 and has been completely transformed to provide the prefect living space and in turn the perfect place to stay when on holiday in Edinburgh. The lounge area is very spacious and has a foldout oak dining table to accommodate 6 adults. The stylish leather sofas, small balcony and plasma tv make this room a true delight. With views both up and down The Royal Mile. The master suite in this apartment has large windows looking down Edinburgh's famous Royal Mile, a Super King size double bed (or 2 Singles), double glass wardrobes and a fully stone tiled en-suite bathroom with power shower. Our double room has a queensize bed, double wardrobe and views directly onto The Royal Mile. The third bedroom also overlooks The Royal Mile from jeffrey street side, this bedroom has 2 fullsize single beds or 1 x Super King Size bed. This apartment has two delightful bathrooms the main bathroom is a family size facility with a full size bath, power shower, heated towel rail and shaver point. The second bathroom is an en-suite behind a smoked glass door in the master bedroom. Both bathrooms are tastefully decorated in oversize stone tiles, and fitted with white suites. Although when staying on Edinburgh's Royal Mile in one of our Edinburgh Holiday Apartments the vast selection of fine dinning, traditional and contemporary restaurants are literally on your doorstep, we have insured that our kitchen is fully equipped for your convenience. Equipment. Electric hob, Electric oven, Microwave, Dishwasher, Kettle, Toaster, Fridge and washing machine (drying rack). 2 x additional full size Aero Beds available on request. The property is all on one level. The entrance hall has all rooms off it.. 3 bedrooms, bathroom, kitchen and lounge. All rooms except the kitchen have a view of The Royal Mile. The property wraps around the end of Cranston Street giving 3 of the main rooms great views both up and down The Royal Mile. Cranston Street is located on The Royal Mile in the heart of the Old town. The apartment is located on the 2nd floor these ancient buildings do not have lift access. No one has reviewed Cranston Street yet. We absolutely lover our stay! The apartment is perfect for a group of 6.. locations is ideal for exploring the city. We took 2 apartments on the Royal Mile as there were 14 of us staying for the May bank holiday weekend. Apartments were near each other. So we were able to keep the group together. Both apartments were clean & lovely and matched the pictures on the website. We couldn't have gotten a better location to stay, we were very close to pub/ clubs. Walking distance to Princes Street and Queens street. Everyone in the group were delighted with the accommodation and would highly recommend any family/group to stay there. Jon was very helpful and informed us of nearby pubs, clubs and local attractions. Had a great stay apartment was clean, spacious and smartly furnished. Excellent location for train station and right on the royal mile couldn't fault it. Big thanks to Jon who sorted our arrival and departure he was spot on nothing was a bother. Much appreciated. First time trip to Edinburgh for a short break and could not have chosen a better apartment. It is in a fantastic location on the Royal Mile close to the castle, Princes St, and the train station with plenty of restaurants and bars nearby. The apartment was clean, spacious with all the facilities you need and right above a corner shop. The owner, Jon, was very helpful and friendly. The stairs to the apartment were a bit of a hike so not suitable for those with mobility issues. Otherwise highly recommend this apartment to anyone looking for a city break in Edinburgh. Would definitely book again. We were late to book as we wanted to time it right to match with daughters birthday (she wanted to see the pandas at the City Zoo), train connections, school time, etc. Emailed various establishments across Edinburgh to see if they could accommodate us (family of 6) for the weekend. Jon was quick to reply and suggest suitable plans for us. Very helpful. Answered our queries very quickly too. Was there to meet us at the apartment and show us were everything was. Nice touch that ! The accommodation itself was clean, user friendly and comfy. Nice layout, kids loved it. Location wise, it was perfect. Short walk up the hill from the station. On the Royal Mile and short walk to many attractions. Good restaurants and bars near by too. Would definitely recommend and we hope to come back. Only suggestion - maybe have some complimentary toiletries available. Apart from that - excellent. This appartment was in a great location. Parking was a little pricey. Overall a great place to stay if you want to see the sights of Edinburgh. Can not say enough about our wonderful vacation. The Rental people were very helpful in our search for a perfect location. When we arrived at the Condo, we were very pleased with our "home" for the next few days. It was very clean, well furnished and the kitchen was very well equipped with all we needed to cook when we weren't going out to eat at the many wonderful restaurants steps from the unit. Convenient to everything Edinbrough has to offer, we loved the Unit so much and can't wait to go back!!! There are about 3 floors of stairs to climb to get to this unit, but if you are up for it; the location is well worth the climb! fantastic apartment, fantastic location, fantastic price!. The overall service was first class from the booking stage through to checking out! Great apartment in excellent location. Everything on your doorstep! thank you so much. we will definitely recommend it and would definitely stay again. Sich zu Hause fühlen in einer fremden Stadt, die es zu erobern gilt. Geschmackvoll und modern eingereichtetes Apparment. Alles hat funktioniert. Die großen Kinder waren happy, weil es ein offenes W-LAN-Netz gibt. Wir haben uns gefühlt, als würden wir mitten in der City wohnen, obwohl nur Gäste waren. Für unseren 5jährigen Sohn war es toll, dass wir so zentral gewohnt haben und mitten am Tag einfach mal "Nach Hause" gehen konnten. Wir konnten eigentlich alles zu Fuß erreichen. Ein kleiner Lebensmitteshop ist im selben Haus im Erdgeschoss. Cafés und Restaurants gibt es ohnehin überall. Der Kontakt mit dem Vermieter hat großartig funktioniert. Wir hatten seine Handynummer und hätten ihn jederzeit anrufen können. Danke für die schönen Tage im schönen Edinburgh! Jederzeit wieder! This was a well appointed appartment, on the second floor, with views up and down the Royal Mile. It looks a little bit austere when you first enter the building, like the servants stairs, which on reflection may well be what it is. The rooms are all a good size so even with four of us and the little one there was loads of space and everything you need is supplied. Jon the owner was really friendly and accommodating, he met us personally and showed us around, I'm sure nothing would have be to much trouble had we needed anything. I would strongly recommend this apartment; my partner and I took her brother, his wife and their two year old daughter to stay there on their trip to the UK from Spain. They loved it as did we. Great setup for large family. Excellent location on Royal Mile. Jon was a great host! Highly recommend. Our group of 5 adults stayed in this apartment for 3 nights in Sept 2011 and found it to be just perfect. Location along the Royal Mile was so handy for everything you would want to do in Edinburgh. The 3 bedrooms and 2 bathrooms made life very comfortable. The apartment was spotlessly clean with all conveniences. We would definately stay there again and we recommend it to everyone. Thank you Jon for your recommendations about places to visit and local eateries and carparking - it was all invaluable information. We stayed here for a long weekend at the start of September. The flat is in a fabulous location in the old town, really close to the station. We were a party of 7 and were all pleasantly surprised by the amount of space the flat provided, and although I didn't sleep on the aerobed, my friend that did for 4 nights said it was really comfortable. I would certainly recommend this flat to friends and family, and hope to visit again myself some time soon. Great apartment located in the heart of all the action!! We will be back.. already recommended to our friends. We stayed here in July 2011.. just what we needed perfect size, clean and the staff were great. We rented the Cranston Street apartment. Very nice apartment - perfect for our family... location is ideal for spending a week in Edinburgh. The apartment itself was Clean, tidy and Jon was a real help when we arrived. Recommended to friends. We came to Edinburgh to celebrate a 30th birthday. There were eight of us so we used the aero divan beds in the living room as well as all the bedrooms. The apartment itself was immaculately clean and nicely decorated in a very modern style. The eight of us fit in very comfortably - even with the beds in the living room. The location of the room is absolutely fantastic. It is right on the royal mile with a balcony in the living room looking up the road onto the mile. It meant everything we wanted to see was within close walking distance. The only downside was the noise from the street at night but with a location as ideal as this it was a small price to pay. We will definitely stay here again if we come back to Edinburgh.